Given we ran a lengthy interview on the Black Lung series earlier in the week, in which brewery co-founder Josh Uljans told us all about the beer's genesis and subsequent evolution, there's no need for background here. 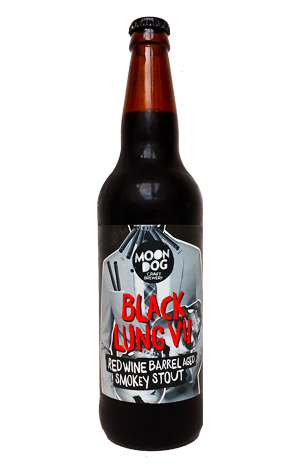 That said, the beer has been put inside 650ml bottles for the first time, it spent time in former Merlot barrels – the first time wine has featured – and, with seven cigars now at play on the label, the skeleton ran out of room in his gob and had to shove a couple into his suit pocket. As for the beer itself, once again it's based around heavily peated malt and Josh's concerns earlier in the week that the smokey aroma on brew day hadn't seemed as intense as in previous years can be safely allayed. Indeed, any impact from the wine is minimal in the face of the peat character, with the barrels acting more as a home for the beer to age and gain some drying tannic qualities rather than imparting any noticeable fruitiness. Continuing the theme from the Dainton beer added to the site this week, a guest comment from Will Ziebell on the aroma: "It's like walking into a room in a share house after your mates have been smoking cigars while playing poker." To which we'd add, flavour wise, that it has that old crate pulled from an ocean character to it too. In short, it's Peat 4-0 Merlot, which will presumably be music to the beer's very many fans.